The 16th International Exhibition of Halal products MIHAS 2019 (The Malaysia International Halal Showcase) was held in Kuala Lumpur on April 3-6, 2019. 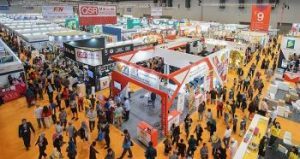 This event is the largest exhibition in South-East Asia in the field of halal products, organized by Malaysia External Trade Development Corporation, the press service of the Foreign Ministry reported. Food, beverages, halal cosmetics, Islamic fashion, textiles and medicines, as well as services in tourism, finance, logistics and e-commerce were exhibited at MIHAS 2019. Products of more than 800 well-known companies, which was visited by more than 23 thousand visitors from 80 countries were presented at the exhibition. The Embassy of Uzbekistan in Malaysia also attended this exhibition with the National stand, where the products of food industry of the country, in particular of such companies as Elite Food Group and For Tea were presented. Special interest of business circles of Malaysia, Singapore, Indonesia and China was caused by high taste quality of products from Uzbekistan. In particular, the unique packaging of disposable ketchup, mayonnaise, honey and other sauces produced in Uzbekistan on the basis of advanced and innovative technologies of our time attracted the attention of the world’s leading airlines, hotels and fast food chains. In addition, the network of world-famous coffee shops expressed interest in acquisition of various types of cookies from Uzbekistan for their subsequent realization in South-East Asia. Following the results of MIHAS 2019, preliminary agreements were reached with Malaysian companies on delivering production of Elite Food Group to Air Asia and Batavia Indo Global PT company for distribution in hotels and fast food chains of Malaysia, Singapore and Indonesia, sale of oatmeal and chocolate biscuits for coffee chain of Old Town company, sale in the Malaysian market by Enagic Sdn. Bhd., as well as their sales in Turkmenistan, sending about 400-500 Malaysian tourists to Uzbekistan in the second and third quarter of 2019.